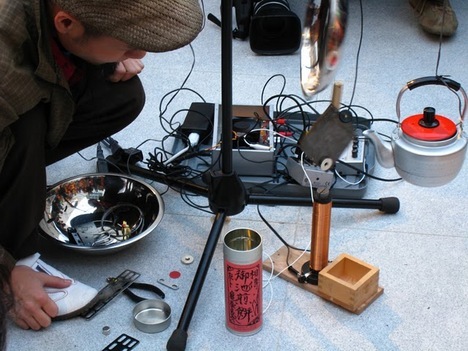 Kanta Horio is an experimental artist, inventing devices using magnets and motors to produce both designed and coincidental phenomena, and pursuing new means of expression. Following his “viewKoma” of 2006, he has released “viewKoma2“. Those who are involved in filmmaking, interface designing, or music might wonder how these exciting experimental devices are created inside Horio’s head. SHIFT interviewed Horio regarding his new video and himself. 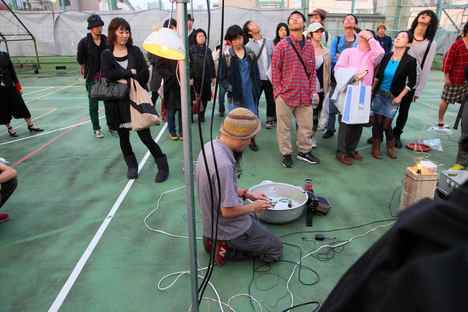 I do live performances and exhibitions using self-invented devices. One of my works is as below. How did “viewKoma2” become released? At the beginning of this year, I was taking part in a group exhibition “Vibrations of Entities” at NTT Intercommunication Center (ICC). They asked me to launch a related event and I decided to do a live performance with Tetsuya Umeda and Takashi Ueno. Three of us performed around a video camera installed a in a remote room. This live video was then projected on the exhibition room’s monitor. “viewKoma2” is a recording of this performance, edited and pressed. Is “viewKoma2” a sequel of “viewKoma”released in 2006? Yes, they are both based on the same idea. The idea of having a live performance at ICC came from Umeda, based on the first viewKoma. Umeda and I did a performance at my place to be streamed for an event called placard which took place in my Swedish friend’s house, where all the performers and audience wore headphones. We recorded the performance, made 10 copies to be played on PC, with a marble each. If you put the marble inside the CD hole, you can also play it as a spinning top (= koma, in Japanese). This is how viewKoma was born. What is the theme of viewKoma2? When we made viewKoma, we had an impression that we’ve done something epoch-making. This time we wanted to pursue further. When you do a collaborative work, how do you and your collaborator decide on sharing roles? Why so? In case of Umeda, all happen spontaneously. Our specialties and geographical advantages automatically apply. I’m not sure about working with someone you have no common interest with. It must be hard and I see no value there. For now, unless you work with someone who could share the same vision with you, it seems useless. When did you first get interested in phenomenon such as magnetism? I guess since when I was little. Are all of the movements presumed? Or are they coincidental? Actually, it is impossible to presume every movement when it comes physical materials. But at the same time, I presume something coincidental happen. Consequently, I am not that sensitive to that difference between the two. You majored in sound engineering in college. What were the works during your studies? I was originally studying computer music and interface. To make it simple, it’s about a combination of input device, sound source, and output device. The guideline of this combination is often said variations of performers’ gestures makes musical expression ricier. But this is becoming banal. So, I assigned spontaneous physical phenomena input device, or corresponded sound resource to output device, which contributed pretty much to my recent works. Dorkbot is a series of worldwide events started in New York. Gathering electric geeks, it takes place all around the world. 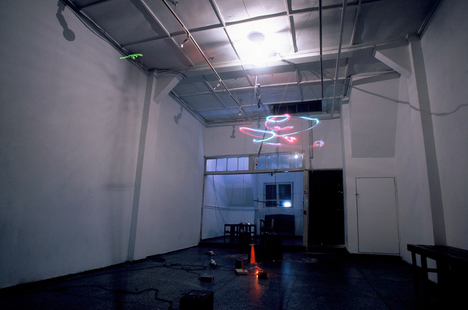 In 2005, Kazuhiro Jo, exonemo and I launched Dorkbot Tokyo. We called for people from different fields to do presentations, live performances, and shops. Archives are here. The last time we had the event was in 2009. As the borders between the fields diminished, I think there is no more need to continue the event. I will try out new format next time. What would you like your audience to feel from your works? Let me see. Your works are not necessarily evaluated as you wish. So I let the audience decide. What are your upcoming activities? Any new materials or medias that you have an interest in? I will be performing in Seoul on July 28th with Jamie Allen, Ryu Hankil, Hong Chulki. 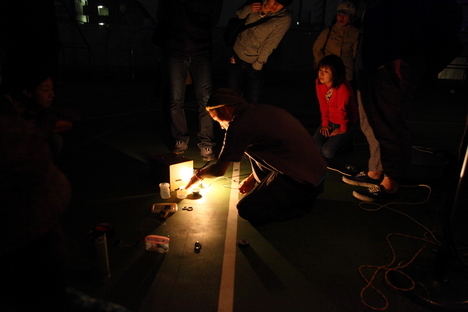 In November, I will join Umeda for his exhibition. Among many that I want to handle are static electricity and potential energy.